From the many different projects that pass through the shop we've chosen a couple of items of interest to share some more information about. The high performance engine featured on our welcome page is a Ford 351W bored to a 408cid and can be found at the dragstrip on the weekends. This project began as a "rough" Ford Motorsports SVO block that was align bored, squared, and bored & honed at the shop. 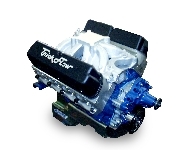 It is built around an Eagle computer-balanced rotating assembly and sports a set of Trick Flow "R"-series cylinder heads. It turned 630 horsepower at 6700rpm on the dynamometer. The VB160SF Verticle Boring and Milling Machine is the "crown jewel" of our operation and is featured on the Welcome page of this website. The VB160SF is a piece of equipment not found in many automotive machine shops where conventional boring bars and stands are still in use. 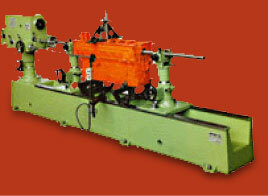 This vertical boring and milling machine offers tremendous versatility, accuracy, and precision. Engine decks can be resurfaced and cylinders bored in a single set-up. With a block-truing fixture in place, engine decks can be precision squared and desired deck heights can be achieved. This Machining Center is also capable of resurfacing large cylinder heads, installing cylinder repair sleeves, repairing lifter bores and a variety of other custom machining operations. The VB160SF is the ideal machine for stock, performance or restoration projects. - bores from 2.040" to 8.000"